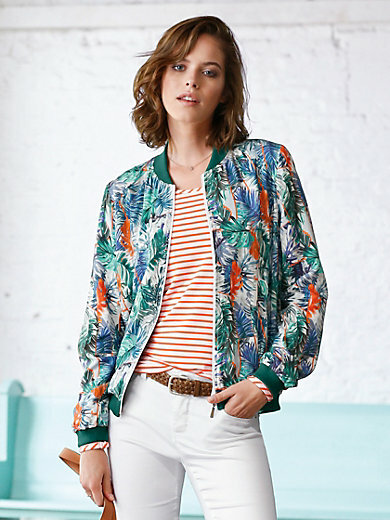 Blouson jacket by LOOXENT: trendy and cool, a real fashion must-have with brilliantly coloured jungle print and pretty, plain ribbed cuffs and hem made of 95% cotton, 5% elastane. The exclusive LOOXENT print, makes each blouson jacket unique! Front zip fastener and 2 zipped pockets. 100% viscose. Lining 100% acetate. Length approx. 26ins. The blouson jacket is machine washable.